For more than 40 years, Sill Optics has been designing, producing and offering telecentric lenses for machine vision. Based on the success of profile-projection lenses, which are still available, a wider range of telecentric lenses for modern imaging processes has been developed to meet demanding requirements. 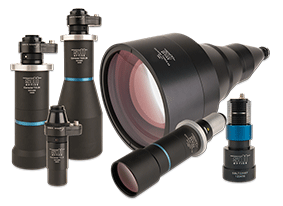 Furthermore our product range has been extended by lenses with coaxial illumination, entocentric macro optics, wide-angle lenses and telecentric condensers. Sill Optics’ philosophy is to develop and produce completely at their own site in Germany. Our flexibility, besides high quality, is also to offer customized solutions, modifications and designs on short notice. Our catalog presents only our most common products. In addition we offer customized systems of special telecentric or entocentric lenses up to complex opto-mechanical systems. Our resources comprise both extensive experience in optical design and mechanical engineering. Production with modern technologies from single prototypes up to medium quantities is possible to meet highest demands. Facing the challenge - we are looking forward to receive your inquiry.